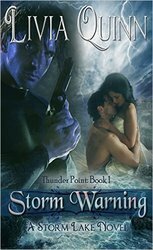 Today’s featured book is Storm Crazy by Livia Quinn. Destiny — is it Mayberry or Middle Earth? to be. If I didn’t have a few little talents, I’d think I was adopted. touch. Pheromones? Then Mr. Jackson stroked while reading me the riot act. belong and I… sorta dropped it. Things went downhill from there. caught in the act by…you guessed it. 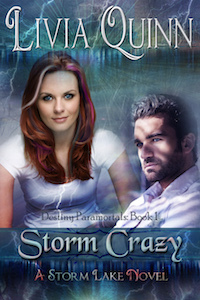 turns out… Things better settle down soon ’cause I’m about to go Storm Crazy. Thanks for having me and letting me share this book, the one that took the longest to come to fruition. Nick and Brenna are like family to me now. I hope your readers love them, too.